You must be a member of the Bogotá Food and Wine Group to attend this activity. Would you like to join this group? Wish to discover Indian cooking with profesional chef and learn about culinary Indian tradition secret and travel for a while to Indian culture? 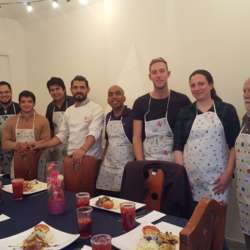 Discover and learn traditional Indian recipes and cooking skills and share sociable moments with new people. Discover cooking skills & tricks, develop practical vocabulary associated with cooking (ingredients, tools, actions) share one’s experience with Indian professional in a sociable manner. 4 delicious dishes to learn and cook in home!